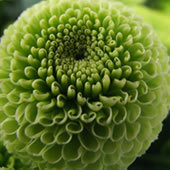 You are currently browsing articles tagged Chrysanthemum. 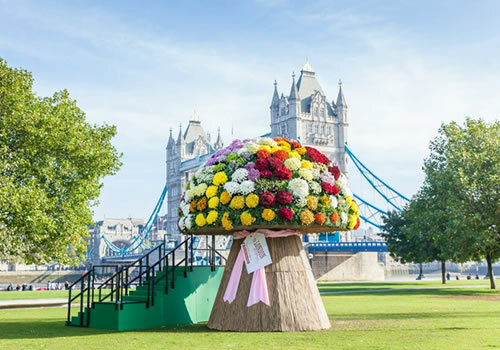 The Flower Council of Holland launched their My Favourite Flower campaign with the biggest bouquet in Britain. 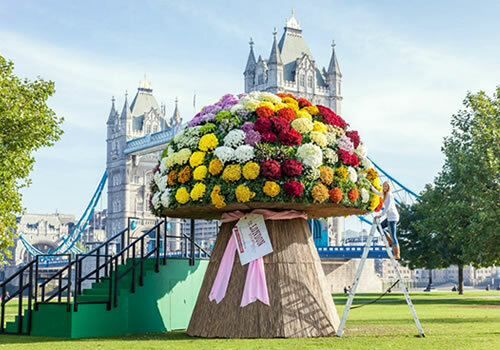 The enormous bouquet was made at Potters Fields in front of London’s Tower Bridge. The Flower council tweeted that people could come and take a bunch of their favourite flowers away. Passers-by were encouraged to give the flowers to give away to loved ones. As research carried out by the Flower Council revealed that half of British adults have never been given flowers, 64% of men have never received flowers and 31% of women only receive their favourite flowers once a year. The colossal bouquet stood 6 metres high and 5 metres wide, it took a team of 6 florists, 18 hours to construct. It contained 12,000 stems of cut flowers, highlighting the UK’s top ten favourite flowers, rose, tulip, lily, orchid, freesia, calla, carnation, sunflower, delphinium and amaryllis. My Favourite Flower camaign has a rather clever website where you can pick your favourite flowers and have the chance to win a bouquet of them. It’s presented by more lovely boys like the ones here, who whizz round selecting the flowers you choose. The campaign has been extended until the end of the month, so you still have some time to take part and win some flowers. Top florist Björn Kroner created these impressive floral skulls using thousands of chrysanthemums. 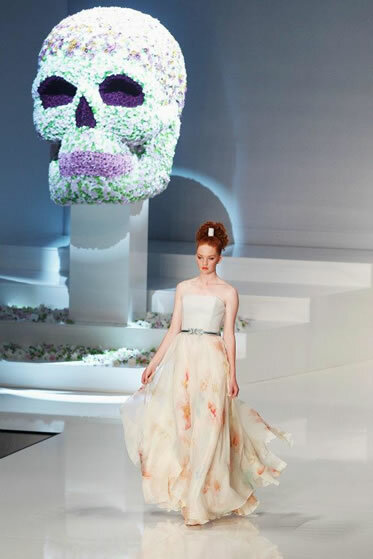 The skulls were designed by fashion designer Michael Michalsky for his Style Nite at Berlin Fashion Week 2012. 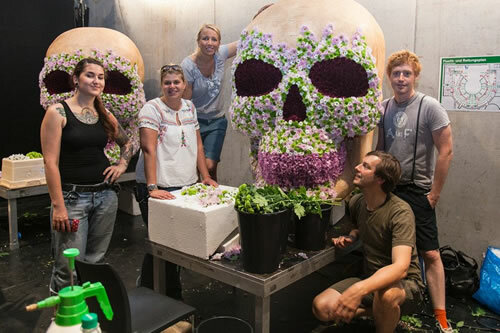 Björn and his talented team used over 5600 chrysanthemums to make the skulls. The heads were individually pinned onto the base. 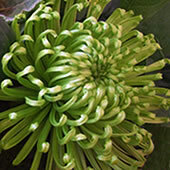 The team used several types of chrysanthemum to make the skulls including single and double varieties. What do you buy the person who has everything? Flowers of course. 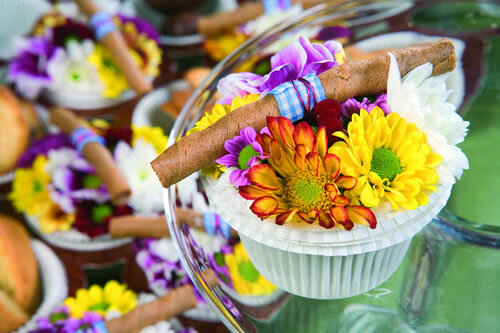 These floral cakes make ideal birthday presents, you can enjoy them for for at least a week and they are calorie free. 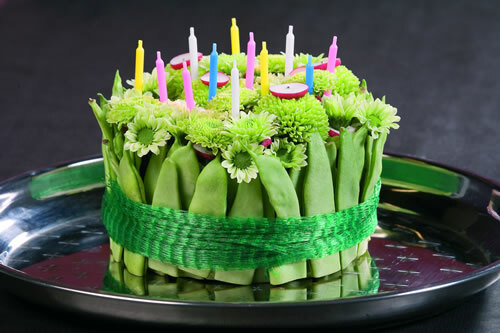 The cake above features green beans and radishes amongst the flowers. Floral cakes tend to be made with chrysanthemums or carnations as their uniform shape works very well en masse and they are long lasting. 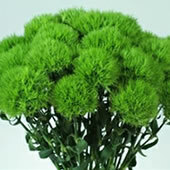 They can also be used as table arrangements for parties or a centrepiece on a buffet table. Floral cupcakes look cute grouped on a cake stand too. They can be made in silicone cake cases which have the added benefit of being waterproof, so floral foam will hold water better. 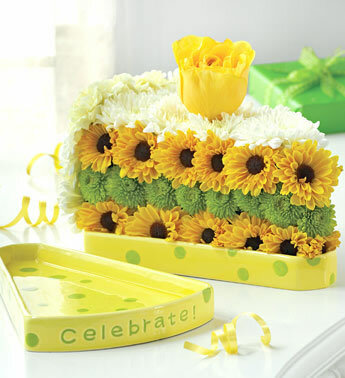 This zesty slice of floral cake has been placed on specially shaped dish, but any decorative plate or tray could be used. A group of two or three cake slices on a cake stand would make a fun centrepiece. This dreamy rose is a soft white, with a touch of green on the outer petals. 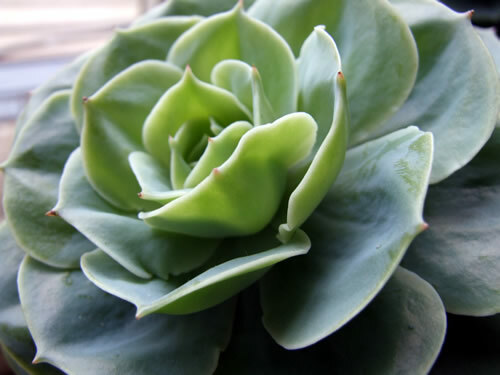 It’s long stemmed and has a lovely large head, with up to 55 petals. 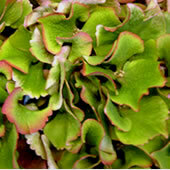 It has a strong stem and can last up to 2 weeks. 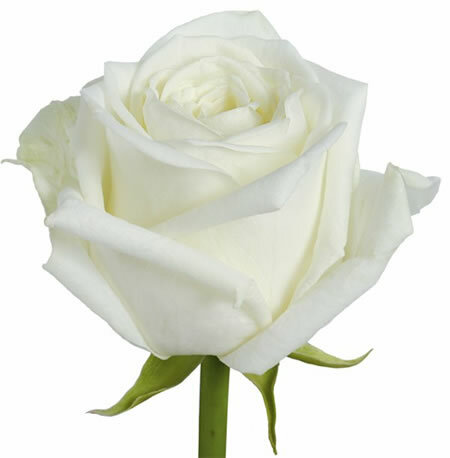 To top off a perfect white rose, it also has a delicious fragrance. Maroussia is used in all types of floristry including gifts, events and funerals. 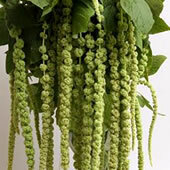 It is particularly popular for wedding flowers. 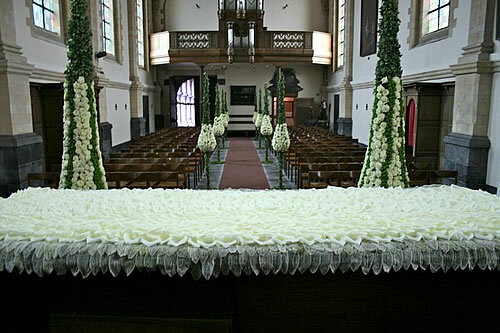 The floral cloth above was made by Robert Koene as part of designs for a church wedding. It consists of 250 maroussia roses and 800 stachys leaves. 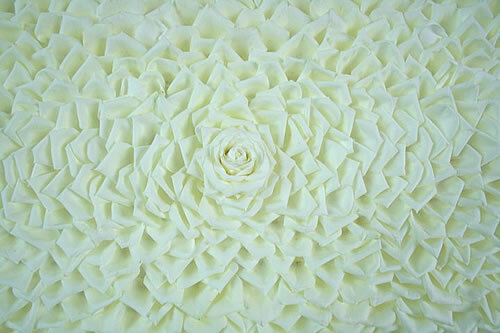 Each petal was individually placed in the intricate design. Robert Koene and his team used 7,500 roses to transform the church. The theme was ‘tears of happiness’, the conical designs along the aisle symbolised teardrops. 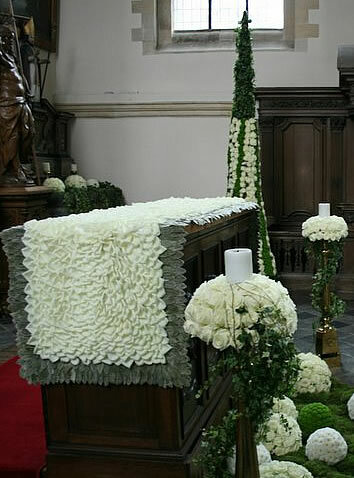 White Naomi Roses and Feeling Dark Green Chrysanthemums were also used in the designs.